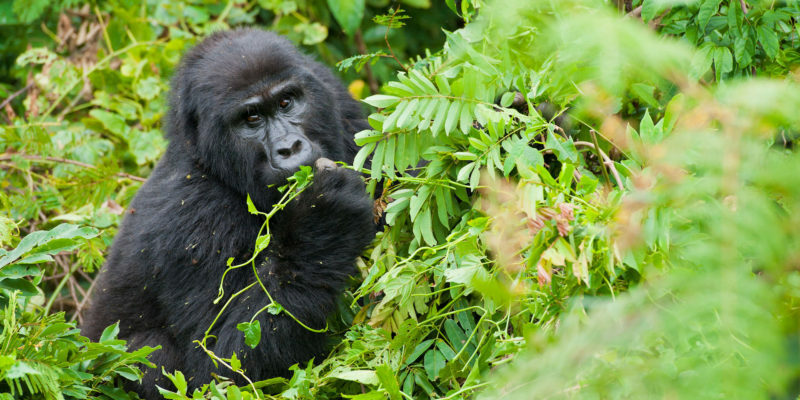 This 6 Days Uganda gorilla trek and wildlife experience is an exciting itinerary taking you to different national parks of Uganda starting with Lake Mburo national park where you will visit and cross the Equator line and also opt to go for a bush walk with an experienced ranger guide to see game at close range. Either ways, you may also choose to embark on a horse-back safari or ride in the park on a mountain bike as you view game. Afterwards. Proceed to Queen Elizabeth national park where you will spot tree climbing lions, plenty of animals and bird species. You will make game driver and also boat ride and exploring the park. The 6 days safari will end with Bwindi impenetrable national park where you will enjoy watching mountain gorillas and other wildlife. All denoted accommodations & inclusive activities. African Unique Safaris and Tours 24 Hours support. Arrival at Entebbe international airport, you will be met by our knowledgeable expert guide and will be briefed about your itinerary and the pearl of Africa which is Uganda, have lunch in town and proceed to a city tour in Kampala that includes the national Museum, Namugongo Martyrs shrine and the amazing Kasubi tombs. Later on you will be transferred to your Hotel for dinner & overnight stay at a choice of accommodations at Karibu Entebbe Hotel, Lake Victoria Serena Hotel Or Protea Marriott Hotel. After early breakfast, your driver guide will transfer you to South Western Uganda to Lake Mburo National park en route to the Park, you will have a stopover at Mpambire drum village, the Equator and Kayabwe where water experiments will be done to prove to you that you are in both atmospheres (Southern and Northern Hemisphere). Proceed for your lunch and check in for your lodge, later in the evening embark your 4x4wd land cruiser and go for an evening game drive, return to your lodge for dinner and overnight stay at a choice of accommodations at Rwakobo Rock Lodge Or Mihingo lodge. sector where you will view the most games in Queen Elizabeth national park has diverse eco- system of grassy plains, rivers, crater lakes, forests, swamps and lakes. This is the second largest national Park in Uganda and a home to various types of wildlife and a game drive in Queen Elizabeth will reward you with views of animals such as lions, leopards, forest hogs, buffalos, elephants, waterbuck, Uganda Cobs and other types of antelopes. Dinner and overnight stay at accommodation of Choice at Enjojo Lodge, At The River Lodge Or Ishasha Wildness Lodge. After breakfast, have a packed lunch and then your driver guide will take you through Queen Elizabeth National Park via the Ishasha sector in the South as you transfer to Bwindi Impenetrable national park. You will set out for the game drive in Ishasha area and expect to see the rare tree climbing lions. The lions can be seen up on the fig trees however it’s not a guarantee that the lions will be seen. Sometimes it depends on the luck and time of reaching the area, in search for the tree climbing lions. In Ishasha there are 4 prides of lions that climb the trees. Unique in the world! The other attraction of Ishasha is the Topis, not found anywhere else in this National Park You will have lunch in the Ishasha sector later proceed to Bwindi Impenetrable the unique jungle. Dinner and Overnight stay at accommodation of your choice at Buhoma Community rest Camp, Buhoma Community Haven Lodge or Bwindi Lodge. Early in the morning after breakfast and a briefing from the UWA officials, set off for the gorilla tracking. This is a once life time experience and unforgettable adventure. The ranger guides will lead you into the thick forest and start your search for the endangered Mountain Gorillas. You will move up and down the rugged terrain until you finally meet these harmonious creatures that will entertain you with performances for about1hour. The activity can take 2-6 hours since the gorillas move up and down. This is an awe some and exciting moment. En route there are a lot of chimpanzees and other types of the primates such as the monkeys, birds and so more. Dinner and overnight at Buhoma Community rest Camp, Buhoma Community Haven Lodge or Bwindi Lodge. Early morning after breakfast, you will check out from your lodge, and proceed to Batwa experience. Batwa are the original inhabitants of these lands and their lineage dates beyond 10,000 years old. Now a struggling but strengthening minority, their traditions and ancient ways of life are extremely interesting and your patronage helps support their continued survival. Their small stature was an evolutionary adaptation to being forest dwellers later after transfer to Kigali. You will have lunch en route and if time allows proceed for craft shops, for souvenirs. Later your driver guide will transfer you to Kigali international airport for your flight back home.